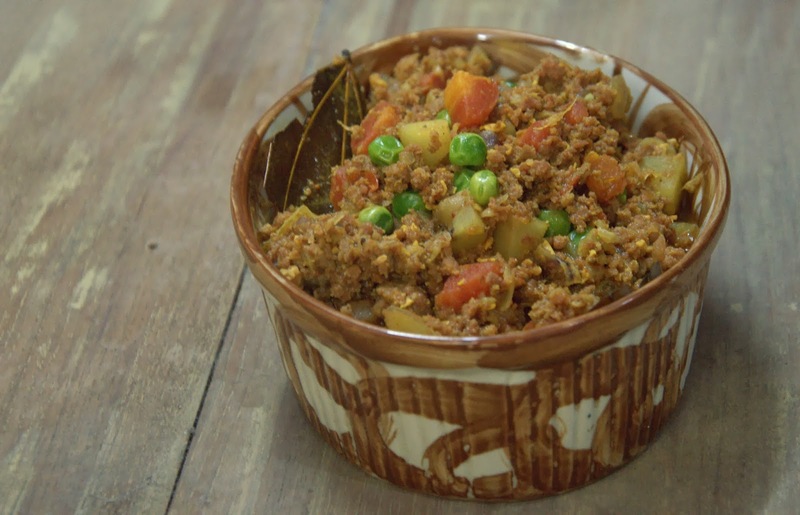 Both K and I love mutton kheema (minced goat meat) and our favourite way is to cook with potatoes, carrots and peas. This is one dish that regularly features on the Katy's Kitchen tiffin menu and is not very different from what I ate as child at my mother's very Bengali table. A simple every day sort of dish, you can enjoy it with hot rotis, parathas or even with rice if it's made with a little gravy. Marinate the kheema for at least two hours. Heat oil in your kadai or wok and throw in the whole spices and once they have sizzled add the diced carrots and potatoes. Fry till the potatoes begin to turn colour. Add the onions and a couple of green chillies and fry till the onions start to brown. Throw in the chopped tomato, stir well and then add the marinated kheema. You will have to stir the whole thing for four to five minutes to mix everything well and to break up any clumps of kheema. Now add the dry spices and a splash of water so the dry powders don't burn. Blend in the spices including the garam masala powder. Add the green peas along with a quarter of a cup of water and then cover the vessel. I use frozen peas. In case you're using fresh peas add them in earlier along with the onions and tomatoes. Reduce the heat and let it simmer. It will be cooked through in another five minutes or so. Taste and adjust salt if required. Add the tomato ketchup and stir to blend in nicely. Serve hot with rotis, parathas, pav or even rice.